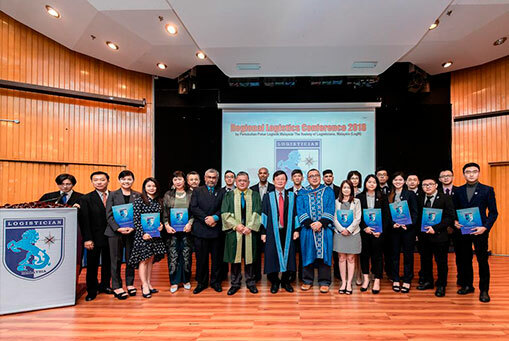 Founded in 2010, The Society of Logisticians, Malaysia (Pertubuhan Pakar Logistik Malaysia 馬 來 西 亞 物 流 師 協 會), also known as “LogM”, is the professional body that confers the title of “Logistician”, or “Log.”, to recognize qualified logisticians in Malaysia, which may include academic and practicing logisticians in the fields of logistics, transport and supply chain. 1. To create opportunities for networking, exchanging of views, sharing of knowledge and experience, and improvement among professional logisticians in Malaysia. 2. To facilitate and enhance the growth of economy in Malaysia through the gained knowledge and experience in logistics and transportation, including sea, air and modes. 3. To support both the international and domestic trading processes in Malaysia, via the ideas of supply-chain management, leading to the globalization. 4. To support both the international and domestic trading processes in Malaysia, via the ideas of supply-chain management, leading to the globalization. 5. To promote the research and development of logistics & transportation, including sea, air and land modes in Malaysia. 6. To encourage the education and training for the practitioners in logistics and transportation sectors in Malaysia. 7. To acknowledge the importance of involvement in the logistics and transportation related trade organization or association in Malaysia. 8. To carry out the social responsibilities, at all levels, through elements of civilized logistics & transportation system. 9. To uphold the professionalism of logisticians in Malaysia.